Show-Command is a new way for researching the parameters and syntax of other PowerShell cmdlets. In this tutorial you will see how to filter using ‘Modules’, then examine the cmdlet properties in a ‘Form’. I see this as a learning tool to compliment Get-Help. The idea behind Show-Command is to provide a sand box for testing another PowerShell cmdlet; I have chosen to examine the parameters for Get-Process, but you could experiment with any cmdlet. The idea is that you can test a cmdlet’s parameters, for example, Id, or computer name. 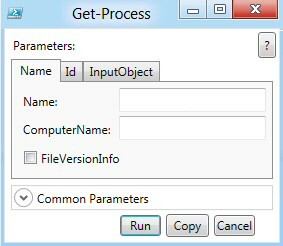 Note 2: Observe how you can ‘Run’ the experiment, or if that button is greyed out, you can ‘Copy’, then paste from the form into the PowerShell GUI. Note 3: It’s worth running Show-Command just to remind oneself of the ‘Common Parameters’. Note 4: If you are experimenting for real I recommend opening the corresponding interface, in this case Task Manager; then I compare the Show-Command form with the Task Manager Process tab. 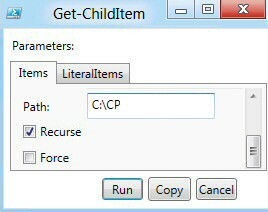 Here is another example which shows how you can learn more about the parameters of a cmdlet, this time it’s gci (Get-ChildItem). Note 5: See from the screenshot how the PowerShell Show-Command helps reveal parameters such as -recurse and -force. If you do this for real scroll up (or down) to see more options. Note 6: Remember that you have the option to ‘Run’, or ‘Copy’. If you choose copy then I suggest you open another ‘New’ script page and paste, that’s the easiest way to see what Show-Command has produced. (Assuming you added a Path parameter in addition to the ticking the Recurse box). For more information see the PowerShell 3.0 ISE. As with other cmdlets, calling for Get-help always reveals at least one interesting parameter. In this case it was -ErrorPopUp that attracted my attention. Note: I discovered other parameters to control the ISE, such as -NoCommonParameters, and -Width. Here is an easy way to get started from the Microsoft Metro UI. From anywhere in the Metro UI if you press the ‘p’ key, you should see a list of the programs and Apps beginning with ‘p’. At this point you could ‘Pin’ the ‘Windows PowerShell ISE’ to the main screen by right-clicking and selecting ‘Pin’ at the bottom right of the screen. I like to drag the PowerShell ISE tile to the left of my screen because it’s one of the most important Windows 8 Tiles that use. 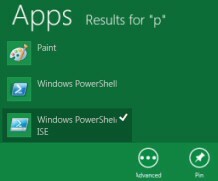 To install Windows 8 with PowerShell 3.0 see here. Auto-Complete is a nifty command to learn more about Windows PowerShell. As you begin to type a cmdlet, say ‘Show-‘ you see a pick-List of likely nouns to append to your verb. Get-Member to list the properties. Get-Help to find out more about parameters. Note how this PowerShell script sorts the ‘CommandType’ in descending order, and the ‘Name’ in ascending order. 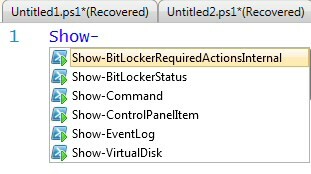 Note 7: Much to my surprise, I discovered these two cmdlets: Show-EventLog and Show-ControlPanelItem. This page explains how to employ Show-Command, which is one of PowerShell 3.0’s new cmdlets. 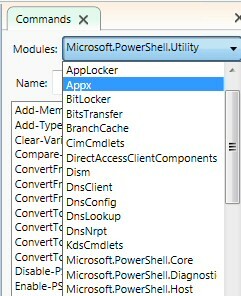 Beginners may find the results a little perplexing and advanced PowerShell users may have better ways of extracting the same information; but for intermediates, I think that PowerShell’s Show-Command is ideal for discovering more about other cmdlets.